I have been looking on Etsy for pot holders and my god they are not pretty!! These are PRETTY! 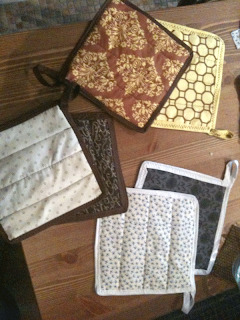 i have been working away this weekend making some pretty homemade looking pot holders. I have never made any before but I really like the ones I made this weekend. I chose nice color palettes with matching boas tape with trim. They will be available at Home Body Boutique this fall!!! P.S. every day for the next couple weeks I will be at home making things! Let me know if you want to come over and do some crafting!! Those are SO pretty! Good job Tamara!! I wanna come over!! I wish i had few weeks to just craft.